We just got back from a fantastic week of festing with a good group of people. Sixteen of us in all. Working on a blog for those adventures. For now, I thought you might be curious just where we live here in Germany. 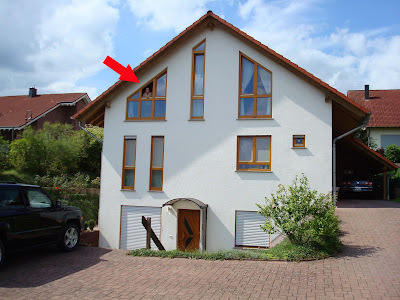 Our home is in Weilerbach, just north of Kaiserslautern, both are in the German state of Rhineland-Palatinate, more commonly known as the Rhineland-Pfalz, or Pfalz for short. Weilerbach is a business center for a number of local small towns. The town has a building where local people establish their utility accounts and handle other government issues. On the outside of this building is a list of the towns surrounding Weilerbach that utilize these services and when each one of these communities was first established. Each and every one of them is hundreds and hundreds of years old. Weilerbach, for instance, began in 1215. The list of locals towns is interesting: Albersbach, Erzenhausen, Eulenbis, Fockenberg, Kollweiler, Mackenbach, Pörrboach, Eichenbach, Rodenbach, Schwedelbach and, of course, Weilerbach. Lots of bachs there. Now, all these towns lie in the Weilerbach section of Landkreis Kaiserslautern, which translates to "country circle" but really means county or district. There are nine sections that make up the Landkreis: Otterbach, Otterberg, Enkenbach-Alsenborn, Hochspeyer, Kaiserslautern-Süd, Landstuhl, Bruchmühlbach-Miesau, and Ramstein-Miensenbach and, again, Weilerbach. Again, a lot of bachs. As I mentioned, the Kaiserslautern County lies within the Rhineland-Pfalz, one of sixteen German states known as Länder. Here's a list (capitals in parentheses): Baden-Württemberg (Stuttgart), Bavaria (Munich), Brandenburg (Potsdam), Hesse (Wiesbaden), Lower Saxony (Hanover), Mecklenburg-Western Pomerania (Schwerin), North Rhine-Westphalia (Düsseldorf), Rhineland-Palatinate (Mainz), Saarland (Saarbrücken), Saxony (Dresden), Saxony-Anhalt (Magdeburg), Schleswig-Holstein (Kiel) and Thuringia (Erfurt). Berlin, Bremen and Hamburg are city-states. 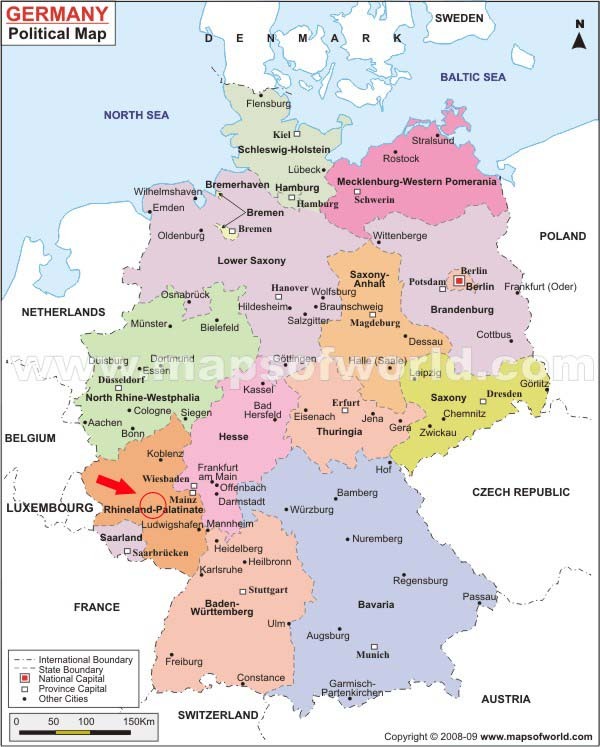 Here's a pretty good map that shows the states of Germany. 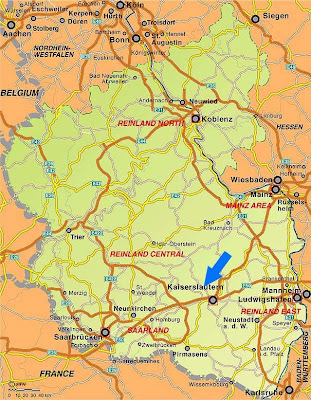 I put a circle and arrow there in the Pfalz to show about where we are on the map. You can click on these pictures to get a bigger image. Now here's a map of the Rhineland-Pflaz with the blue arrow pointing where Weilerbach would be there just north of Kaiserslautern. Finally, zooming in on K-Town. There's Weilerbach with the blue circle. Zooming in even close, here we are. There's me in the upstairs window of our study. What a great geography lesson! It is weird seeing your patio furniture on the porch! Can't wait to come visit in December. I miss and love you!